Potting is the start of some really great landscapes, vegetables, herbs, flowers, and a lot more. Starting your plants indoors can give them a head start and they will have a better chance of being more productive. All Purpose Fortified Potting Mix (Fort V) 20qt bag. This is a complete growing-on mix for soil blocks, trays, or small containers. It is blended from mature compost, sphagnum, rock phosphate, gypsum, protein meal, crushed granite and vermiculite. 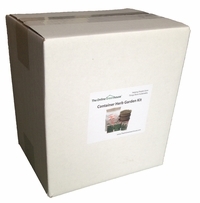 Contains ample nutrients to carry most vegetable and flower starts to transplant. Note: in very small containers, or for certain crops, supplemental fertilizing may be desirable. 10 - 3 inch SixCell CowPots. 6" x 5/8" Natural Wood Plant Label (50pk). 50 labels. These natural wood labels are a beautiful way to mark your cell packs, pots, and rows in the garden. These are not coated and will biodegrade quickly.